IMG_0023, originally uploaded by jahansell. Weren't horse fences usually white? Nowadays I see mostly black ones - is it a fashion trend, or does it have a more utilitarian reason - needs to be repainted less often, maybe? This one is where Sharon Valley Road intersects with Coleman Station and Sharon Station, I believe. This is a really nice shot. Good lines and the lush grass gives it something extra. I think that the black paint has a quality which the horses do not like. So, they don't gnaw on the fence as much. You know, I noticed that in KY this summer. All the fences there are black now, too. Someone here in Kentucky told me is has something to do with insurance. I cannot imagine how, or why, and I don't know if it is true--but you see very few white fences any more. That's interesting to me here in the east. 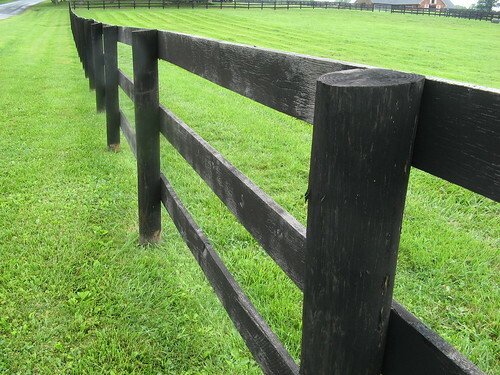 Here http://www.productionfenceworks.com/Production/Horse-fence.html is an article about horse fences.